Helm Auctions has put together over 300 lots for their upcoming Summer Extravaganza. All lots are open for absentee and live bidding online, and everything must sell to the highest bidder. This auction contains Native American artifacts such as a collection of Navajo and Mexican Weavings, Pre-Columbian artifacts, and other pre-historic items. Helm also has featured Native American jewelry, pottery, weavings, baskets, stone and more. There is a small group of Pre-Columbian ceramic sculptures and Plains Indian artifacts up for grabs on the auction block. Live bidding takes place Saturday June 18th, 2016 opening at 12:15 PM Pacific Time. The auction kicks off with great energy at Lot 1 with a fantastic Old Classic Hopi Kachina. One of the best of the auction, this piece of amazing work is circa 1920’s. This cottonwood Kachina has face paint and a painted white washed skirt. The item measures 5 1/2 x 2 1/2 x 1 1/2 inches without stand. This is a very popular find and is likely to exceed the high estimate of $900 when the auction hammer drops down. Photos along with the condition report are available in the online catalog. A pair of Navajo weavings set the stage for the rest of the sale at Lots 14 and 17. First up at Lot 14 is a rare transitional Navajo weaving. This outstanding work is cica late 19th to early 20th century. There is a nice blanket feel to this and it measures 69 by 46 inches. There is only minor thread damage and this is looking great for a weaving from this period. Estimated auction value is $900. 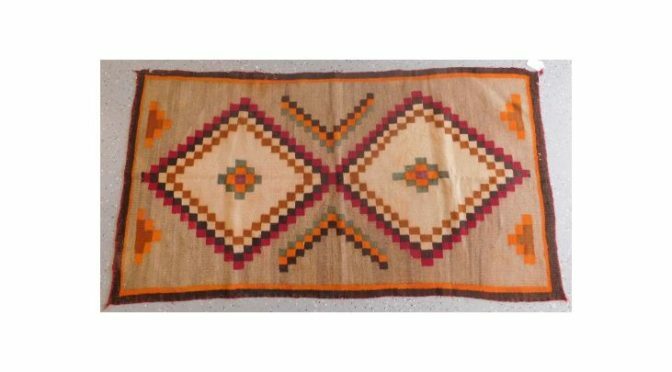 Presented at Lot 17 is an old Navajo weaving from the 1930s. It is measuring 63 by 33 inches and has great red, grey, orange, and brown colors. This is from a great estate of a long time collector in California. This is a great value at auction with only a $500 estimate. Both weavings have several photos in the online catalog for full inspection. Lot 81 is an example of the quality of basketry that Helm Auctions continue to bring to auction. This is a beautiful Papago Grain Storage Basketry Olla believed to be from the 1940’s. It measures 12 by 12 inches and is made from yucca and devil’s claw. This basket has nice shape and is estimated at $750. There is an excellent array of photos for online viewing and this is a must have piece for collectors of fine basketry. Helm Auctions provides fantastic service and is available to answer any questions through email or on the telephone. They have a great reputation on iCollector.com for delivering and providing quality auction consignments for the bidding audience. Absentee bidding is available now in the online catalog and the live action begins at 12:15 Pacific Time on Saturday June 18th, 2016.